This Asian Sweet Chili Chicken is packed with veggies and tossed in a sticky, sweet and subtly spicy sauce. 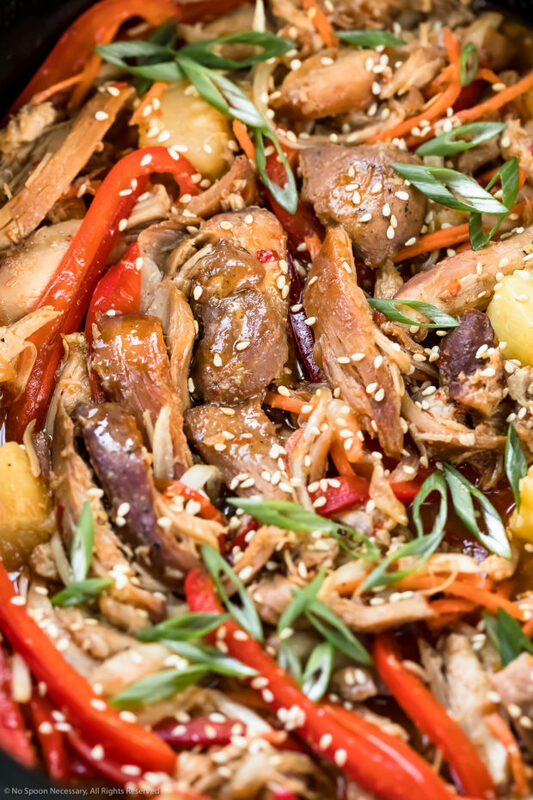 Quick and easy to make thanks to the trusty slow cooker, this chicken is addicting and better than takeout! Today we are cooking with one of my absolute favorite sauces – sweet chili sauce. 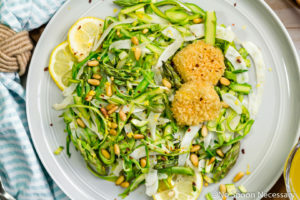 Sticky, sweet, subtly spicy and loaded with flavor, it pairs fabulously with everything from chicken and shrimp to spring rolls and dumplings! If you aren’t familiar with this Thai condiment, you are in for a delicious treat! 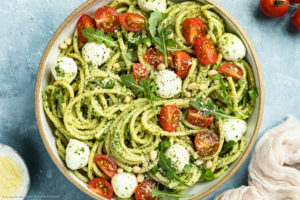 I always have a jar of this sauce on hand in my pantry or refrigerator, and after trying todays easy dish, you will too! 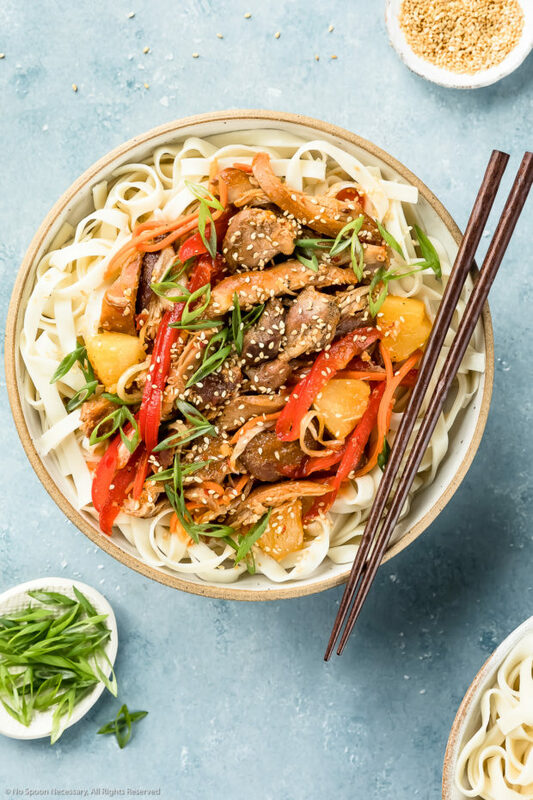 Tender, juicy shredded chicken, sweet red bell peppers, fragrant onions, tropical pineapple and crisp carrots tossed in a sticky, barely spicy, umami packed sweet chili sauce. 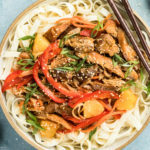 Served over soft lo mein noodles or fluffy rice, this Asian chicken is saucy, flavorful and totally addicting! I kid you not, the Asian chili sauce is so good I could drink it from a glass! But, the best part of all? 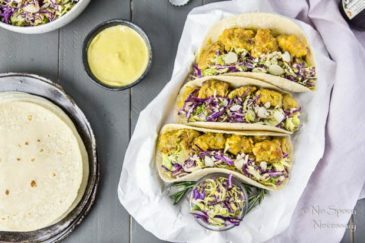 This flavor-packed chicken is ridiculously easy to make and basically fail safe! You just throw the chicken and sauce ingredients into the slow cooker, cover it, then set it and forget it! 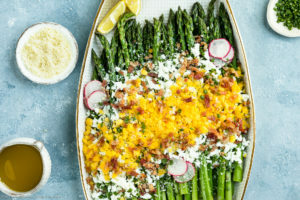 When you are ready to eat, toss in the vegetables and dinner is served! Mouth-watering, sweet and sticky chicken that tastes out of this world is yours for the devouring! Sweet chili sauce, also known as nam chim kai, is a Thai sauce condiment that can be used as a dip for appetizers and pairs deliciously with chicken, shrimp and tofu. Made with chile peppers, rice wine vinegar and varying sweeteners (honey, fruit or sugar), chili sauce is sweet and sour in taste and very mildly spicy. Thai sweet chili sauce can be found in the ethnic food aisle of most grocery stores. What is sweet chili chicken? 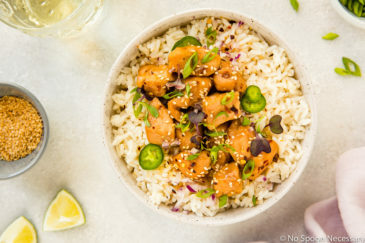 Sweet chili chicken is an easy American-Asian dish made of tangy, sweet and spicy chicken pieces coated in a rich, sticky, addictive chili sauce. Chili chicken can be fried, baked, stir-fried or slow cooked and made with or without vegetables depending on the recipe. What goes with sweet chili chicken? 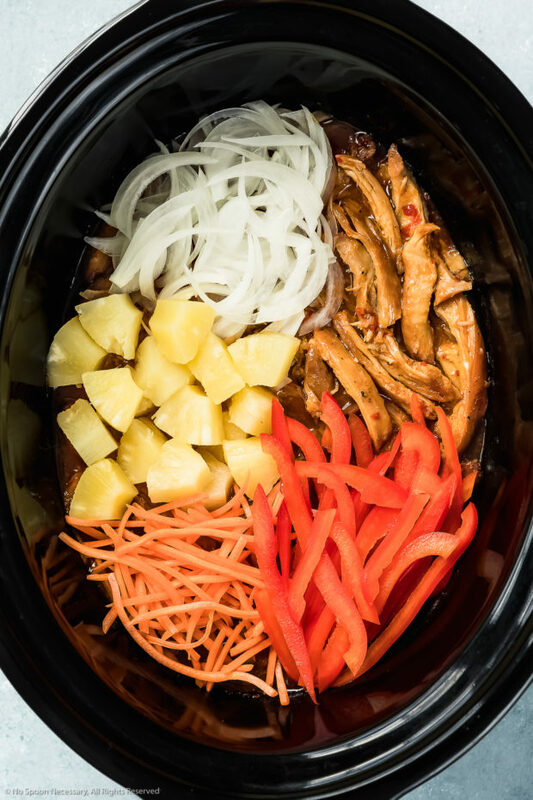 This crockpot sweet chili chicken recipe is already packed with onions, peppers, carrots and pineapple chunks, plus served with noodles for a full-blown meal. However, if you are looking to make substitutions or you are serving a crowd, below are some delicious side serving options! 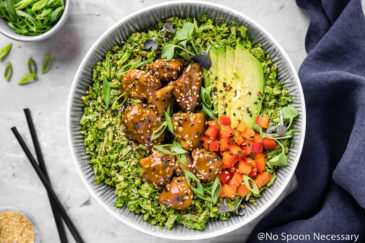 Is sweet chili chicken healthy? Sweet chili sauce has a fairly high sugar content which makes it relatively high in calories. While the sauce does contain capsaicin (chili peppers) which have health benefits, the sauce should be consumed in moderation. 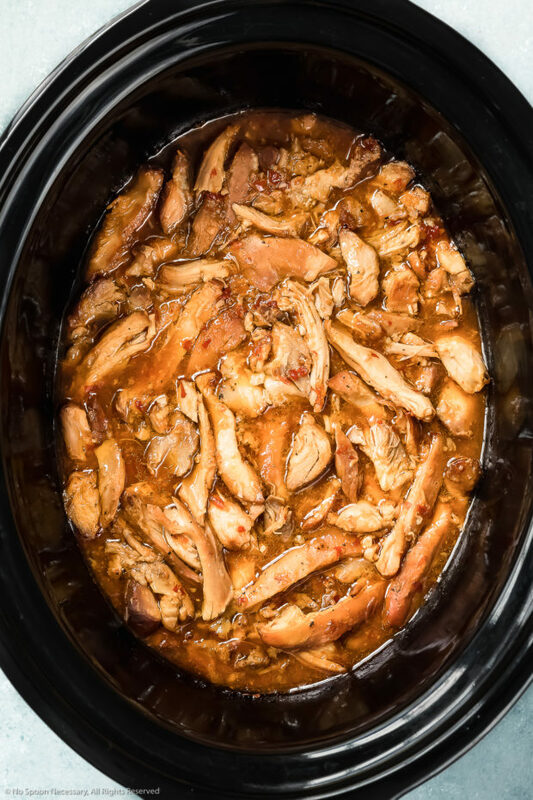 This crockpot sweet chili chicken recipe is packed with peppers, onions, carrots and protein-rich chicken to offset the chili sauce, however I would eat this chicken in moderation. Always remember a healthy diet shouldn’t be about deprivation, but instead moderation! While the recipe below calls for chicken thighs, you can substitute boneless, skinless chicken breasts if desired. Chicken thighs have more flavor and moisture, however chicken breasts are leaner. You can use either all chicken thighs, chicken breasts or a combination of both! 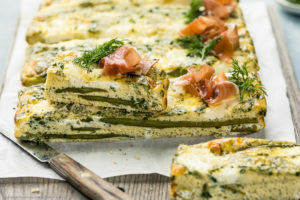 The cooking time in the recipe below is approximate. Make sure you know your slow cooker and don’t overcook the chicken. If you are using a small slow cooker or crockpot and it’s packed full, it will take longer to heat up and cook through. 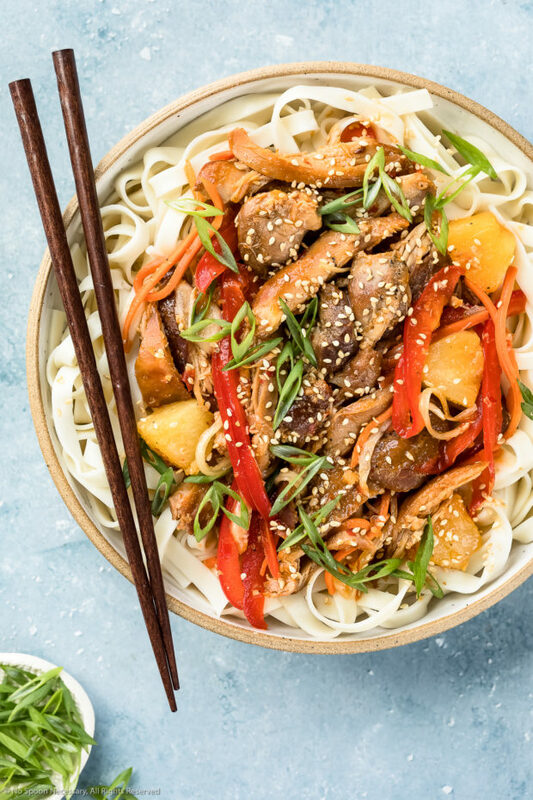 While I served my slow cooker chicken with lo mein noodles, you can serve this Asian chicken over rice, quinoa, cauliflower rice, or any Asian noodles you desire! Cooked Sweet Chili Chicken will keep in an airtight container in the refrigerator for up to 3-4 days, or it can be frozen in a freezer-safe, zip-closure bag for up to 3 months. 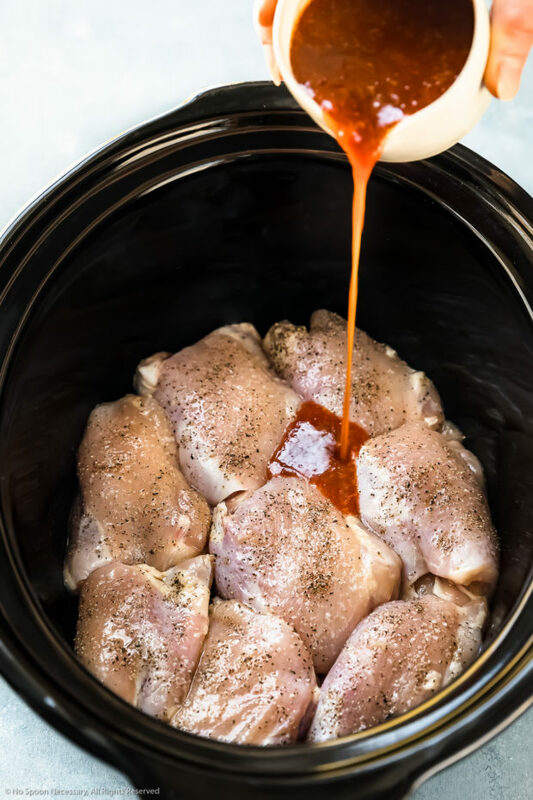 This Slow Cooker Sweet Chili Chicken will instantly become a family favorite! With fall apart tender chicken and crisp vegetables coated in a sticky, sweet sauce so good you will want to lick your fingers clean! Until next week, friends, cheers – to making your own take out! Season chicken thighs generously with salt and pepper. Transfer chicken to the bottom of the slow cooker insert. Make the sauce: In a medium bowl, whisk together the ingredients for the sauce (sweet chili sauce, soy sauce, garlic and ginger). Pour the sauce over the chicken. Cover and cook on HIGH for 3-4 hours or LOW for 6-8 hours, or until chicken is tender enough to shred. Shred chicken: Remove the chicken from the slow cooker to a clean work surface. Shred or slice the chicken and return it back to the slow cooker, along with any juices or sauce that has accumulated on the work surface. Add vegetables: Add in the onion, bell pepper, pineapple and carrots. Stir to combine. Cover and cook on HIGH for 15-20 minutes, or until the vegetables are tender. Meanwhile, cook lo mein: Boil and drain lo mein noodles according to package directions. 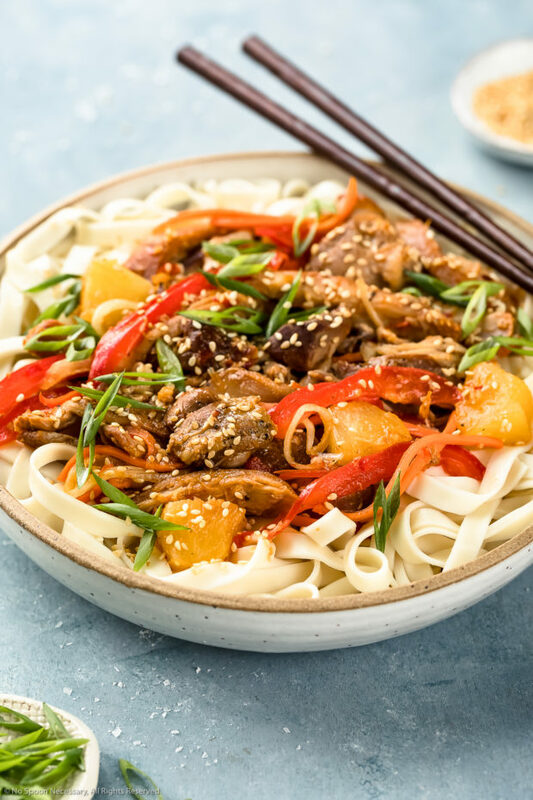 Either add the noodles to the slow cooker and stir well to coat, or transfer noodles to serving bowls and top with sweet chili chicken. Serve immediately garnished with sesame seeds and green onions. The cooking time in the recipe below is approximate. Make sure you know your slow cooker and don't overcook the chicken. If you are using a small slow cooker or crockpot and it's packed full, it will take longer to heat up and cook through. Totally love sweet chili sauce Chey. 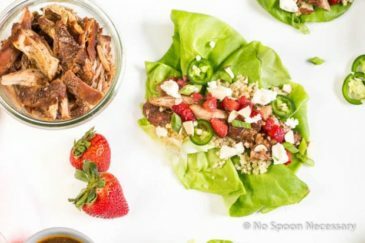 And I’m always looking to add to my list of slow cooker meals! 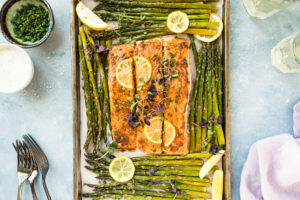 This one looks flavor packed and DELISH! You had me at sweet chili sauce….this dish is sure packed with flavor! Looks like a winner! Sweet chili sauce for the win, always and even better that it just cooks away in the slow cooker 🙂 Love it! You’re the flavor queen, Chey! I LOVE every single flavor you have going on here and I must try this soon! Have a great weekend, girlie! We love the play of spicy and sweet in our house so you know where we stand on sweet chili sauce! This chicken is totally drool worthy, Cheyanne. Love that it’s made in the slow cooker! While I’m not a fan of spicy food, I enjoy spicy&sweet combinations once in a while, and this sauce sounds perfect (I’m not going to drink it from a glass though.) Combined with juicy chicken, that must be super tasty. And personally, I’m going to have it with noodles or rice because I’m not on a diet today (Or never). Well done! 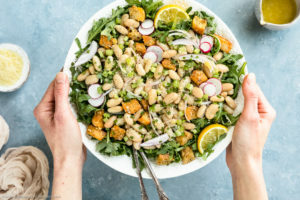 I always love food that’s packed with healthy protein and loaded with veggies. This looks absolutely right up my alley!